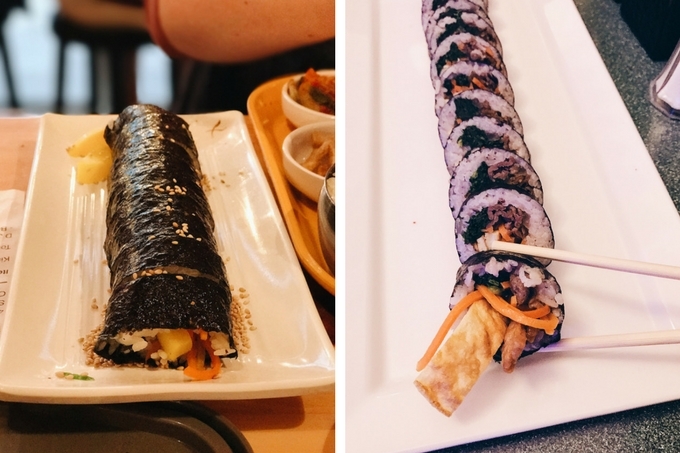 Gimbap (AKA 김밥) is basically the Korean take on sushi, and it’s delicious! Sometimes it can take quite a while to convince me to make a new recipe. This is generally because A) It looks difficult to make, and B) It has ingredients/techniques that I’ve never used before. Reuben’s sister introduced me to the idea of “Korean sushi” – she had tried it while on a missions trip. She explained that the rice was seasoned differently than Japanese sushi, and the fillings were different. It sounded a lot more laid back. 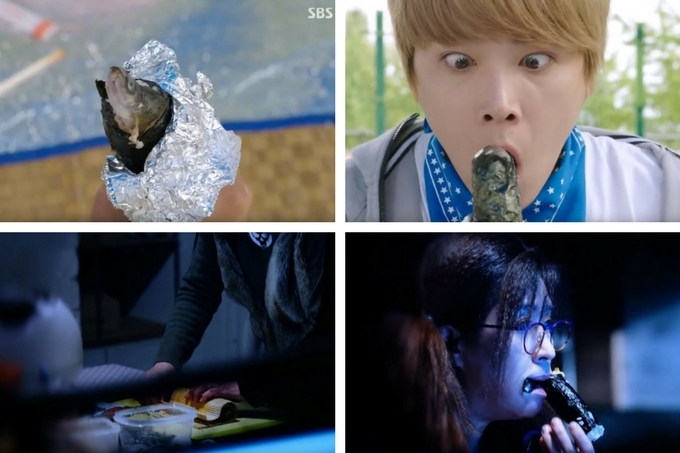 Then I saw gimbap being eaten in a couple of Kdramas. In Modern Farmer it was used as a funny plot point because a character who couldn’t cook made a disgusting version with whole eels inside. In Healer, the techie Ajhumma ate it a few times kind of like a wrap sandwich for a eat-it-quick-and-get-back-to-work meal. Next I ordered it at a Korean restaurant in the cities. It was delicious, but I didn’t like that it had spam for the meat. Spam can hardly be classed as a food in my book. Finally, I had some beef gimbap at a Korean restaurant when we were in Florida. I really enjoyed it, and wanted to try to recreate it. However, it was made with steak, which isn’t always the quickest/easiest/cheapest option for supper. BUT I finally decided to make a ground beef gimbap version. Ground beef is so easy to work with, it’s more affordable than the tender cuts of steak, and it’s still delicious! Win-win-win. You might be intimidated like I was to try to make your own gimbap. Don’t be! All of the ingredients can probably be found at your local Walmart. Ours even carries sushi nori and grass-fed ground beef now! Take a look around the aisles and you might be surprised by what you can find. I would say that besides the actual rolling of the gimbap, making the egg is the next difficult part of this recipe. But it’s really not that hard once you do it a couple of times. 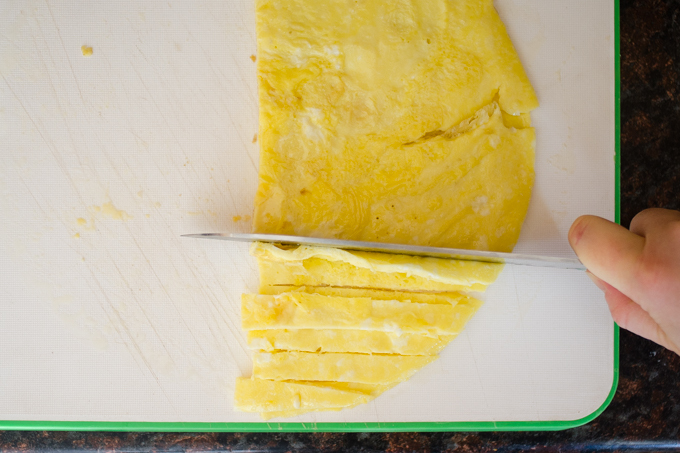 Simply beat an egg with some salt and pour it in a hot, oiled pan. 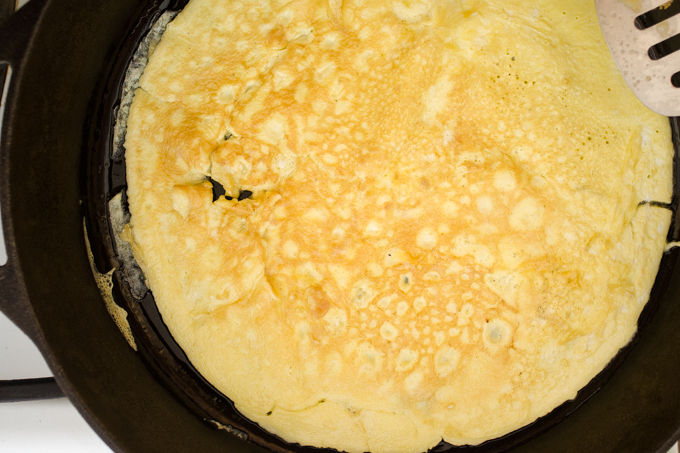 Cook it kind of like a crepe: wait for it to be almost set, then flip the whole thing. Then just cut it in half and into strips! There are different ways to flavor kimbap rice, but for this recipe you’ll be using toasted sesame oil and salt. Make sure you buy toasted sesame oil, otherwise the flavor just won’t be there. …and start to roll. It helps to use your hands to keep the fillings at one end so they don’t spread out all over the place. 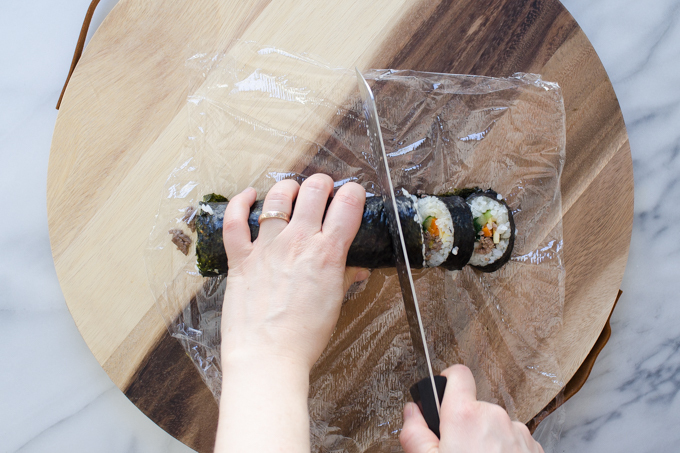 The tricky part is rolling up the nori while pulling up the mat and plastic wrap. You don’t want to roll those up with the nori…for obvious reasons (you don’t want to eat those). Once everything is rolled up neatly, firmly squeeze the roll while it’s still covered with the mat. This helps to seal everything in place. 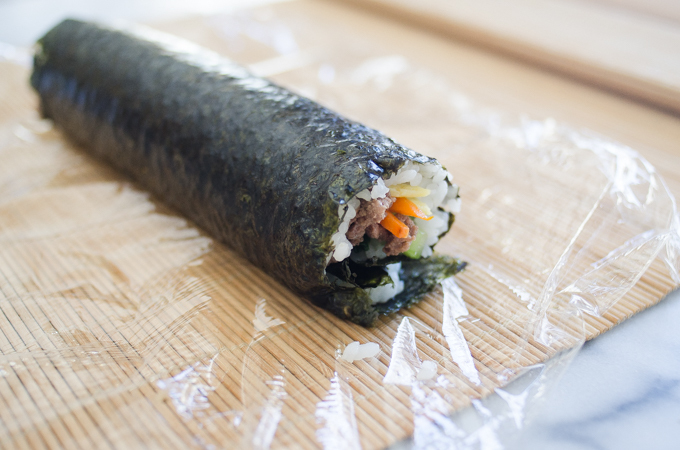 Then roll the mat off of the gimbap. I know I had to get wordy for a minute and it might seem confusing, but just give it a try! Your first few rolls won’t be super pretty, but that’s okay. They’ll still taste delicious! 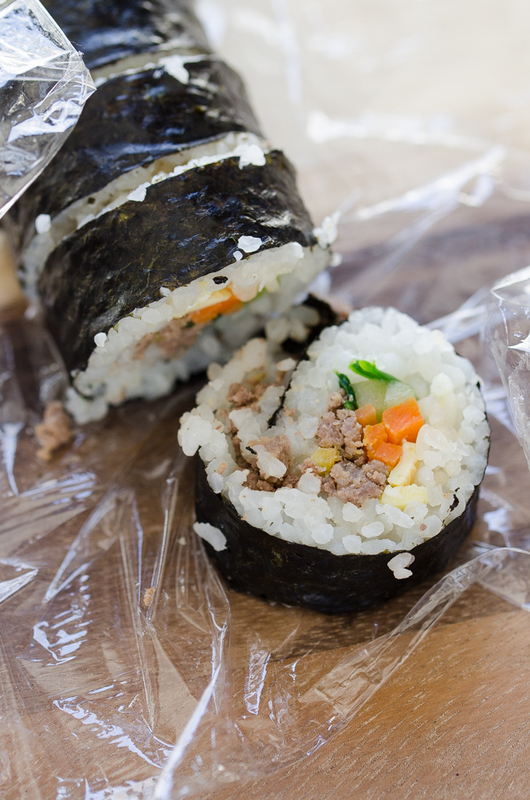 Now just remove the plastic wrap and slice the gimbap! 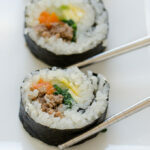 My kids LOVE this ground beef gimbap. James devours it, even though he normally won’t touch cucumber or spinach with a ten foot pole. My caveat about this recipe is that I am NOT trying to say that it’s completely authentic: I chose ingredients that should be readily available to most Americans. A popular gimbap add-in is yellow pickled radish, but I have never seen that in regular grocery stores. You could add another type of pickled vegetable if you’d like that tang in your gimbap. Note: If you have leftover filling ingredients, they’re wonderful the next day over a bowl of steaming rice. Kind of like a deconstructed gimbap roll! Are you resistant to trying new, different recipes sometimes? 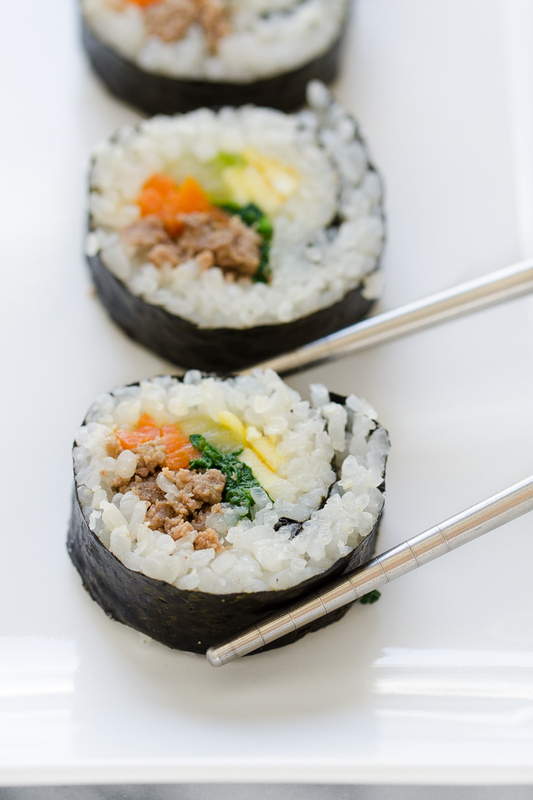 Gimbap (Korean sushi) made easy with ground beef and other readily available ingredients! Rinse the rice in a fine mesh sieve until the water runs clear. Add to a heavy-bottomed saucepan along with 2 1/2 cups water. Bring to a boil over high heat. Cover, turn the heat down to low, and cook until the rice is completely tender, about 15-20 minutes. Allow the rice to cool to room temperature. You can speed up the cooling process by spreading the rice out on a cookie sheet. Add the sesame oil and rice and gently stir to combine well. You can also make the rice ahead of time and refrigerate. 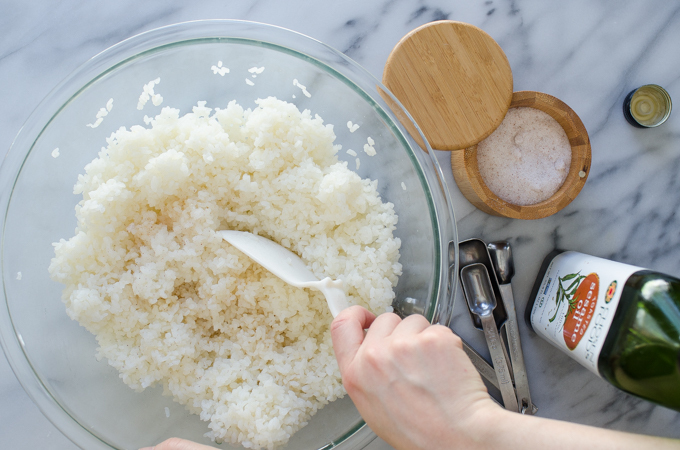 Take the rice out of the fridge to take the chill off while you prep the rest of the ingredients. Using your hands, mix together all of the beef ingredients. Set aside to marinade while you get the rest of the ingredients ready. Bring a medium pot of water to boil. Add the spinach and cook for 1 minute. Drain in a fine-mesh sieve and rinse with cold water. Squeeze out as much cold water as possible. Add salt to taste. Set aside. Lay the cucumber out in a single layer on a large plate. Sprinkle with salt and let sit for 10 minutes. Squeeze out as much liquid as possible. Set aside. 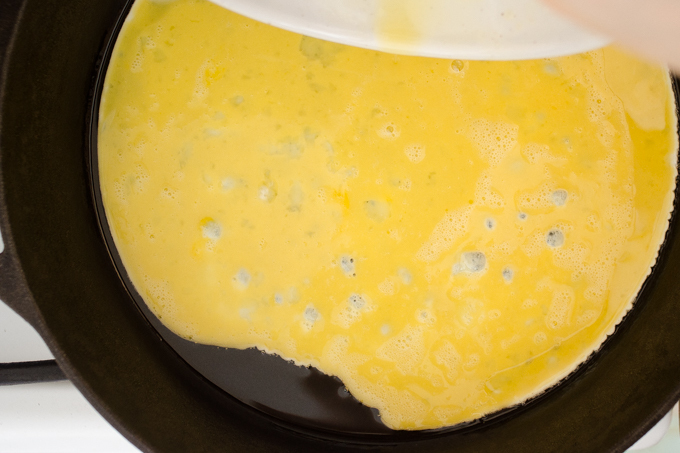 In a small bowl, whisk the eggs with the salt until the eggs are uniform. Heat a 10-inch cast iron skillet over high heat. Add a tablespoon or so of palm oil. Once it's melted, add the eggs all at once. Turn the heat down to low and allow to cook until the eggs are nearly set. Flip and cook for just a bit. You want the eggs to remain a nice bright yellow. Remove to a cutting board. Cut in half and then into strips. Heat another tablespoon of oil in the now-empty skillet over medium-high heat. Add the carrots, salt to taste, and cook just until tender-crisp but still brightly colored, about 3-5 minutes. Remove from pan and set aside. Add the beef to the now-empty pan and cook until no longer pink. Remove to a plate and set aside. Line a bamboo mat with plastic wrap. 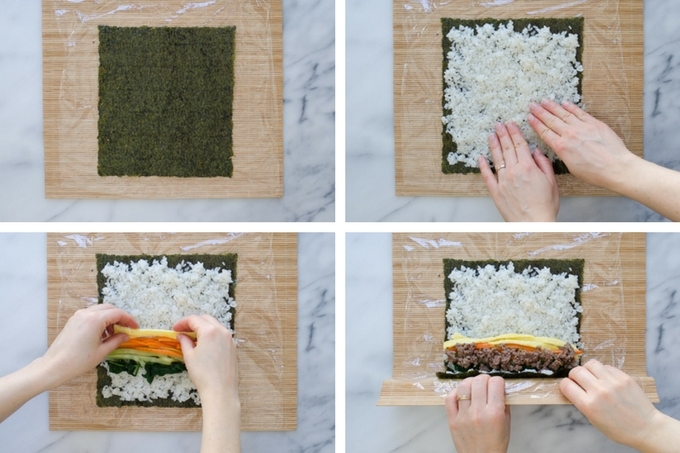 Place a sheet of nori on top. 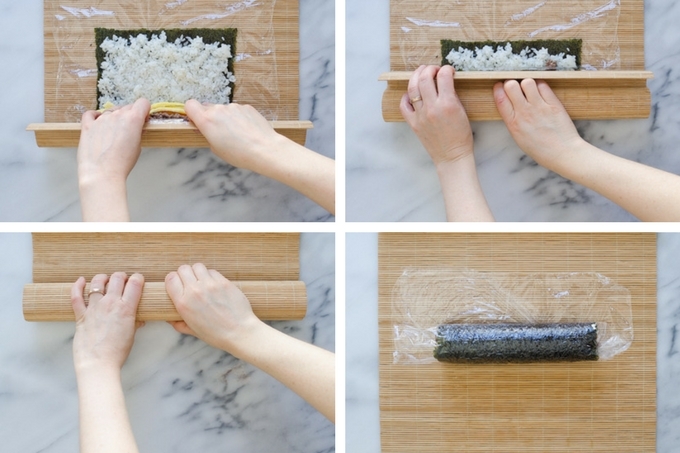 Using wet hands, spread some rice out evenly on top of the nori. Gently press it into the nori. 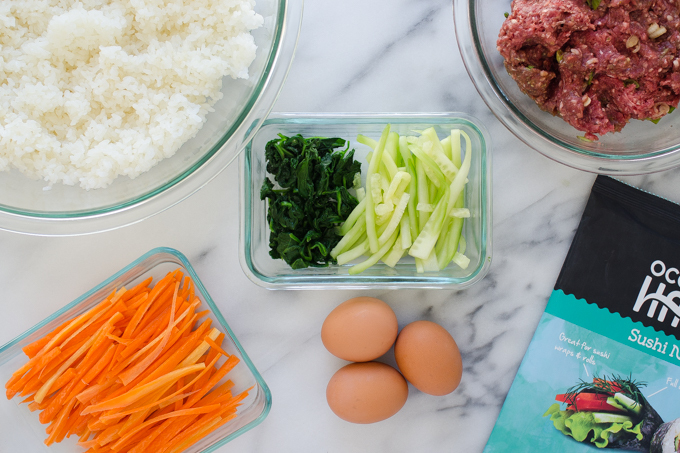 Place a strip of the carrots, cucumber, spinach, eggs, and beef near the front end of the nori. 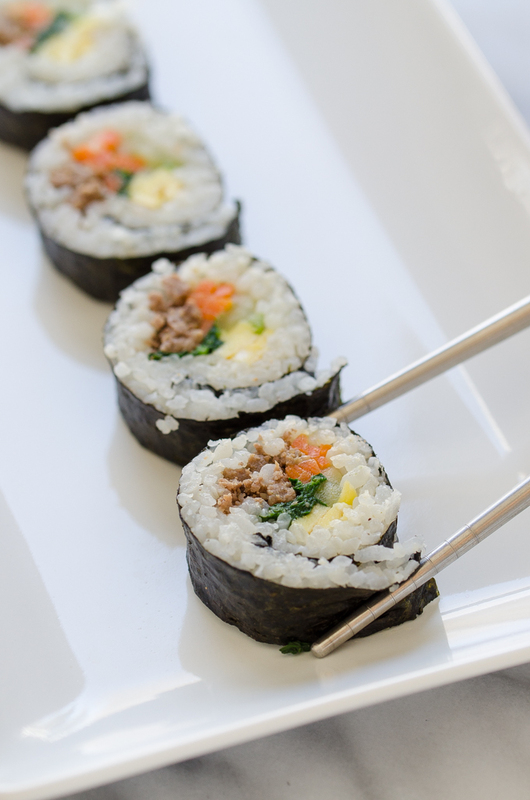 Roll up the gimbap, using your hands to keep the ingredients in place. Squeeze the roll to make sure everything stays put. Remove the plastic wrap from the roll and cut into slices. This looks intriguing! The pictures are so pretty! I find your Korean posts fascinating! Keep them coming.